FORT DRUM, NY -- “There’s nothing that gives a Soldier more of a head-rush than sling loading equipment for the first time,” says Capt. Joshua White. 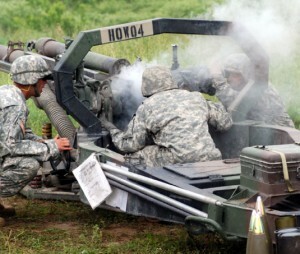 Eighty of the 375 Soldiers of 1st Battalion, 258th Field Artillery were able to experience that rush during the unit’s June annual training at Fort Drum. New York Army National Guard Soldiers of the 1-258th from Jamaica, the Bronx and Newburgh, along with supporting troops from the 42nd Infantry Division, arrived at Fort Drum June 7 to begin their annual training. In addition to sling load operations, the artillerymen also participated in direct and indirect live-fire exercises with the unit’s seven M102 105mm howitzers, and practiced evacuating overturned Humvees during their time at Fort Drum. The M102 howitzer, a weapons system first used by the Army in the Vietnam era, will be replaced in 2009 by the new M119A1 howitzer, which weighs about 400 pounds less than its predecessor. The new M119A1 is easier to sling load to the UH-60 Blackhawk, a helicopter used in many combat zones. Safety, an important aspect of the training that took place, was encouraged further by the use of the Humvee Egress Assistance Trainer, or HEAT. The HEAT is a simulated Humvee that rotates at various angles in order to teach Soldiers how to evacuate an overturned vehicle. The Soldiers of the 1-258th said that the howitzer live-fire exercise performed was the most rewarding aspect of their annual training.